MEET Karen Tyrrell, award winning children’s resilience author. 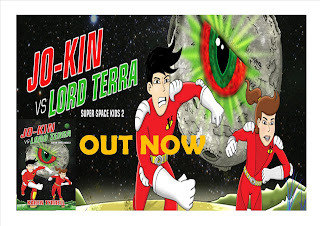 Karen launches her second book in the Super Space Kids series, Jo-Kin vs Lord Terra, an action-packed FUN space adventure for kids 7-12 … into the cosmos. Jo-Kin Battles the It and Jo-Kin vs Lord Terra (Super Space Kids) are out NOW on Amazon and in book shops across the galaxy. Can Jo-Kin defeat the all-powerful Lord Terra? Blast off with gadgets, robots and funky food in a hilarious outer space adventure that empowers you via teamwork, problem solving, and resilience. Once upon a time, Josh Atkins was a computer geek and science nerd. But not anymore. Now Josh Atkins is cool and life at Sunny Hills School is awesome. So Josh isn’t thrilled to see the teenage leader of Super Space Kids, Commander Nova, turn up at his school. And the reason for Nova’s visit is bad news for everyone: You have to help save the junior Super Space Kids and stop Lord Terra from destroying planet X. If you don’t, he’ll be on his way to planet Earth to destroy us as well. Josh, code-named Jo-Kin, has a horrible feeling that he and his partner Sam, code-named Sam-Wich, can’t win this battle against Lord Terra. But what do you do when the world is counting on you? You have an accident and break your arm. At least that is what Sam-Wich does. Could this situation get any worse? Yes, because Jo-Kin needs a new partner and is teamed up with his archenemy Mitch. Not an auspicious start to a mission to save planet Earth. Looks like we’re all doomed. What follows is an exciting and fun adventure, full of danger, spaceships, gadgets, robots and aliens. 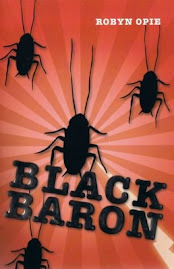 Luckily for us, this wonderful novel reveals the power of teamwork, problem solving and resilience. Otherwise, planet Earth might not be here today and then you wouldn’t be reading this review. 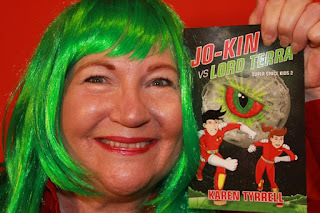 Jo-Kin vs Lord Terra is perfect for middle grade readers aged 7 to 10 years. Kids will love the adventure which is sometimes fun and sometimes full of danger, suspense and ugly aliens. This big kid loved it. The characters are great. I felt like I knew them, as if I was part of their team. Plus, the action and humor make this book an enjoyable read. I highly recommend Jo-Kin vs Lord Terra to all the kids in the universe, big or small. Jo-Kin vs Lord Terra is the latest release from award-winning author-teacher Karen Tyrrell and is book 2 in the Super Space Kids series. There are more adventures to come. Yes, Josh Atkins, life is awesome.